This is my entry for TechLUG's 25th Technic contest: a spider excavator. must look like a spider excavator (duh). A spider excavator is a very special kind of excavator, able to work on very hazardous terrain or conditions. The main difference with a regular excavator is in the chassis: it has 4 arms with a wheel at each end (sometimes 2 of the arms don't have wheels), which can move up, down, left or right, sometimes extend, to fit the terrain. My goals and specifications changed a lot during the study of the MOC. I wanted to build a full PFS MOC at first (never having played with pneumatic much). Up to eight channels at my disposal : 4 motors in the chassis, 4 motors in the hull. It seemed nicely balanced, with a BB and 2 IRs in each part. A few tests later, it seems that a PFS chassis (with LAs) isn't a viable option: too heavy, arms getting out of sync... In short, first disaster. 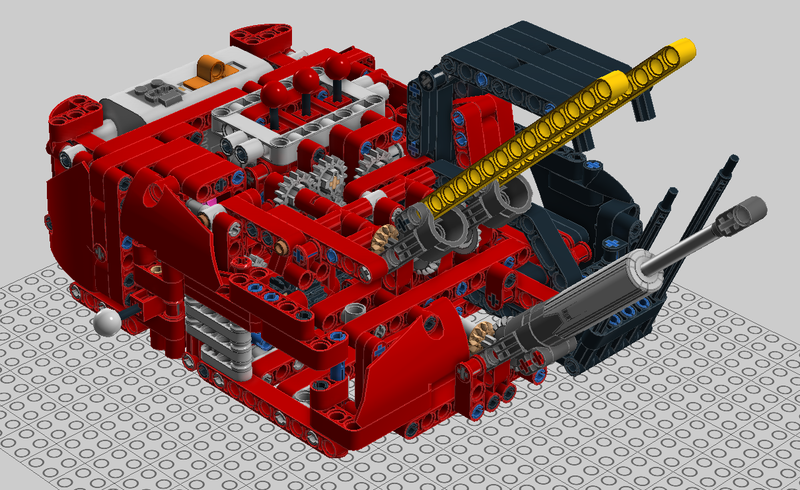 Second attempt, and in the spirit of losing weight, I try a fully pneumatic chassis. It's a brand new adventure for me, having never MOCed in pneumatic before. Luckily, I had just ordered enough cylinders to build the legendary 8455, so I dived in. The specifications become: chassis with pneumatic arms (2 cylinders per arm), pump in the chassis, activated by a shaft coming from the hull. The hull follows the same weight-loss cure: 1 motor remains and everything will be activated via reversed gearboxes. After another bit of time, I finally get a chassis that seems to work. I then get to the hull. I wanted to keep the extension of the arm, so I needed to include 5 functions : 2 articulations for the boom, extension of the arm, articulation of the bucket and rotation of the hull. After quite a few hours of LDD and tests, I had a hull that contained 4 reversed gearboxes and a pneumatic pump and switch for the bucket (so that only two shafts had to come through the first articulation of the boom). It's big, heavy and extremely complicated. But before adding the boom, it seems to work properly: the functions activate via the gearboxes and the weight of the hull, however important, is not too important for the chassis. Then come the boom and arm: with LAs (except for the bucket). Problem: regular LAs are very long (and mini-LAs are too short): the boom is gigantic compared to the hull (already quite big) and to the chassis. To top that, the weight of the ensemble becomes too important: the chassis bends under it. And then, as a cherry on top of the cake, the complexity of the hull added to the length of the boom makes the motor slow down and the cogs spin out of the pins. Second fiasco. New specifications for the hull : let's go pneumatic ! The cylinders are shorter than LAs and the mechanical part is much simpler. I keep the motor to run the pumps and extend the arm and I ditch the rotation of the hull, that becomes manual. The hull becomes much shorter, as I only have one reversed GB to include, and a second regular GB to choose between the chassis pump and the hull pump (to reduce the load on the motor). The boom follows: two cylinders for the two articulations, gear racks for the extension of the arm and a mini-cylinder for the bucket. Voilà! As mentionned above, this is a manual spider excavator, meaning all commands are directly on the MOC. The MOC is largely pneumatic, and the pumps being motorized, you only have to flip switches to activate the functions. Let's look at them from bottom to top. The chassis is made of 4 arms with a wheel at the end. Each arm has a double articulation, motioned by 2 pneumatic cylinders. The first allows the arm to move up and down and the second allows the arm to move left and right. The arm is built from 3 liftarms with a hub for the wheel at the end. The geometry makes the wheel stay parallel to the chassis and the other wheels, which allows the MOC to be moved, even when the arms are deployed. To simplify the incorporation of the cylinders, each part of the articulation is offseted (contrary to a ball joint). The arms are linked at the front and at the rear : there are 2 switches to move the arms up and down and 2 switches to move them left and right. On one pair of arms, there are stabilizers that anchor the MOC to the ground. They deploy manually and lock with pins with end bush. The pump is in the center of the chassis, in the axis of the TT in order to be aligned with the shaft coming from the hull. The chassis is compact and very robust. Under the weight of the hull, the cylinders hold well and the arms don't bend. The MOC can easily be driven, with the arms deployed or not. The hull has all the commands for the boom and another switch to choose the pump. Also in the hull, are the BB and the motor: firstly there's no room for them in the chassis, and secondly the BB is used as a counterweight for the boom. The switch for choosing the pump is located on the side, to avoid confusing it with a switch for the boom, which are all located on the top of the hull, behind the cab. The boom switches are in order, from left to right: first articulation of the boom (pneumatic), second articulation of the boom (pneumatic), extension of the arm (mechanical), articulation of the bucket (pneumatic). The movement of the boom and arm as been studied to reach a goal, other than classic excavation work: being able to withstand the weight of the MOC. It can reach the ground, whichever position the chassis is in. The first two articulations are actionned by two pneumatic cylinders. The specificity comes from the arm, which can be extended, which is characteristic of spider excavators. The extension is done with 13L gear racks that slide inside a couple of panels. This is the sole mechanical function of the MOC. The 13L gear racks allow for a sufficient extension of the arm, given its size. This extension is mandatory to allow the arm to reach the ground and to be in the most stable position to lift the excavator. The extension is activated by a reversed gearbox, actionned by the motor. Lastly, the bucket is articulated with the help of a mini pneumatic cylinder. In total, the MOC has 11379 parts, including 1 rechargeable BB, 1 M motor and 77 pneumatic elements : 44 hoses, 13 T-pieces, 11 cylinders, 7 switches and 2 pumps. The MOC weighs 1.33 kg. The design has been given a particular attention. The hull has 11 panels and flex hoses that give it its original form. The MOC is very compact, thanks to the use of a single M motor and the small BB. These two elements are well integrated and the BB even serves as a couterweight in the hull. 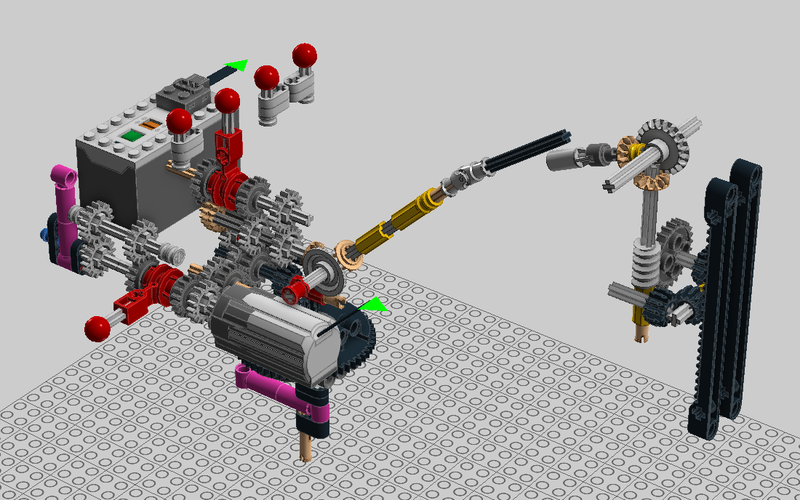 Because of the use of pneumatics, numerous hoses run on and through the MOC. On the boom, they look like real hydraulic tubes. The chassis is a bit more pared-down, for a more mechanical aspect. The pneumatic hoses, numerous in the chassis, go through the underside and are well integrated. The cab is fully equipped with joysticks, gauges and has a door. Light projectors are located on top of it. Ligths (stop, rear and turn signals) are present at the rear of the hull. Each part of the excavator has its defined color: the chassis is black, the hull is red (with the cab and the base being black) and the boom and arm are yellow, with a black mobile part. I would have liked to make the hull blue, as on the Kaiser S12 from which I drew my inspiration, but a lot of parts that I used don't exist in blue (eg the new 3x11 panels). This was a very difficult contest. After four chassis, 3 hulls and 2 booms, there is a certain pleasure to play with the finished MOC. My 8 year old son wants this so badly! He wishes it was a set for purchase :-) Nice work!